Despite the surging popularity of digital marketing, direct mail continues to hold a significant position in today’s industry. Direct mail is a reliable, trusted, and effective marketing tool for compelling recipients to act, attracting new customers, increasing customer loyalty, boosting brand awareness, reactivating dormant accounts, and delivering profitable results. In fact, over 100 billion pieces of mail (catalogs, postcards, letters, brochures, and flyers) were sent through the mail in 2014. Nevertheless, it’s not just marketers who are keeping direct mail alive—consumers agree that direct mail is still an effective form of communication. Consumers are reporting that they do read their mail! In the recent InfoTrends study Direct Marketing Production Printing & Value-Added Services: A Strategy for Growth, consumers report viewing two-thirds of the direct mail that they receive. Furthermore, when consumers were asked what they did with their direct mail, 82% reported reviewing their direct mail pieces for a minute or more. Over a quarter of respondents—28%—will take at least two minutes to read their direct mail. Perhaps most significantly, over three-quarters of consumers agree that direct mail is an effective means of communicating. In 2015 U.S. companies sent an average of 1.47 million e-mails per month, most of which can be considered spam. Of all e-mails sent globally, 71% to 80% are spam. That’s a lot of unwanted e-mail for a consumer to receive, it’s no wonder that 79% of consumers will act on direct mail immediately compared to only 45% who say they deal with e-mail straightaway. Direct mail is an effective marketing tool for many reasons. It can compel recipients to act, attract new customers, increase customer loyalty, boost brand awareness, reactivate dormant accounts, and deliver profitable results. According to the DMA, direct mail is the preferred channel for receiving marketing from local shops (51%) and banks (48%), while e-mail is preferred for events and competitions (50% each). Further, according to an Epsilon study, as many as half of U.S. consumers prefer direct mail over e-mail. 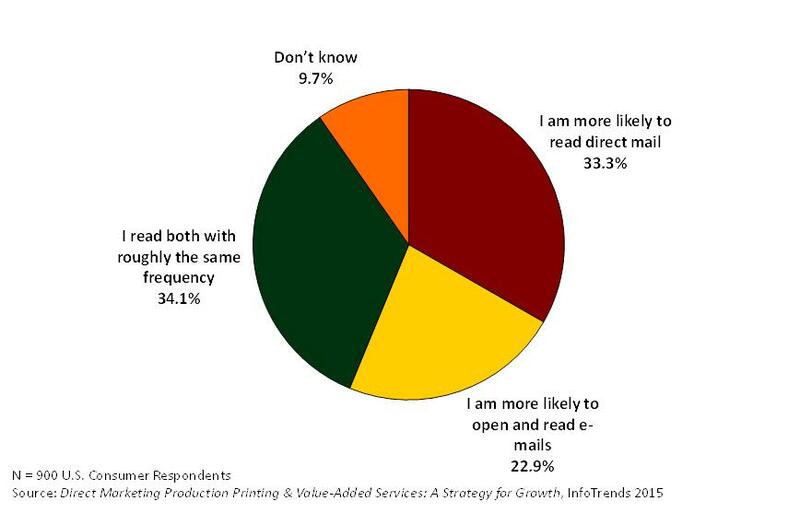 A third of the U.S. consumers that responded to InfoTrends’ direct marketing study reported reading direct mail more than e-mail, while 34% said they opened and read e-mail and direct mail with equal frequency. Are you more likely to read an e-mail with a sales/promotional offer OR to look at a piece of direct mail? Since consumers engage with both print and e-mail, communicating with them using an integrated marketing campaign will drive higher results. In addition, direct mail can be a part of an interactive customer experience when used in conjunction with mobile devices and associated mobile apps. There are a number of tools that can enable a printed piece to trigger an interaction from a smartphone, including image recognition, augmented reality, NFC tags, and quick response codes. More and more direct marketers are integrating interactive elements with print both outside and inside the envelope to connect consumers to videos or mobile-enabled websites so they can learn more about a product or service, or creating mobile landing pages that enable consumers to take advantage of a coupon or discount. In addition, a direct marketer can point the consumer to a website or a personalized URL that can be accessed from a PC. While direct mail has faced competition from e-mail, social media, and other types of electronic media, marketers have discovered that it still is an excellent channel for reaching consumers and driving response. Direct mail is a tried and tested media form, and it continues to be a staple marketing technique for companies of all shapes and sizes the world over. Today’s consumers and businesses are operating with all channels on, so service providers must be channel-agnostic and build business models that can generate revenue from printed and digital content. As the technology evolves and marketers continue to blend content from the print and online worlds, direct mail looks more promising, and exciting than ever. The statistics speak for themselves—people read direct mail and respond to it. In short, direct mail remains successful because it works!